This post is part 2 in a two-part series on how I currently teach social media metrics and social listening. 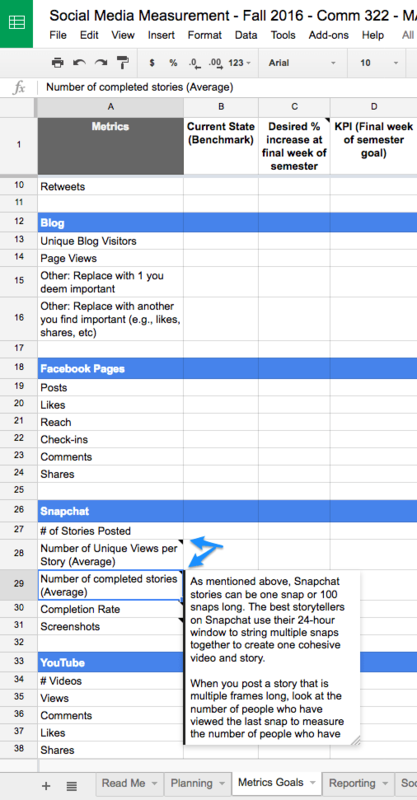 You can see the previous post, which provided a spreadsheet that I use to empower students to track metrics for the social media accounts they manage in my social media class (2016 syllabus; and all articles about this class). We’ll be using that same spreadsheet, though a different section of it, in this blog post. You can access it here. In this post, we’ll discuss Microsoft Social Engagement and how I integrate it into the the social media class so students can engage in social listening. Through the Microsoft Academic Alliance program, I have been very fortunate to get my students access to the Microsoft Social Engagement software. So what is Microsoft Social Engagement? In short, it is a social listening tool that enables users to track metrics for public social media accounts or posts (e.g., keywords or hashtags) such as posts on Facebook, Twitter and Instagram. You can also track mentions forums and blog. You do this by programming different ‘analysis focuses.’ That is, I can have 1 that searches one or a set of topics, keywords, social media accounts – say, my brand – and I can have another analysis focus that focuses on my competitors accounts, keywords, etc. From what I can tell, you can have as many as you want so long as you don’t go over your monthly quota of social data units. For example, in the social media class we follow our social media accounts and mentions of them, and specific keywords surrounding our department’s brand, such as our hashtag. The software enables you to quickly visualize several things such as key phrases, sentiment, social platforms or accounts that posts are coming from and their sentiment, posts across time, sentiment across time, geo-location, and geo-location across time. Below is a quick look at the main hub you see when logging into Social Engagement. In it, you can see sentiment in the top left. You can see the sentiment for each platform below that. In the center, you see the volume of posts across time for the keywords we are tracking. In the top right you can see the phrases being used related to those keywords. And in the bottom right, you can see the proportion of the posts that are being analyzed in this instance from each platform. There are 4 main sections of the software: Overview (the page shown above), conversations, sentiment, location and sources. They are pretty self explanatory. When you click on a pie chart or graph or keyword, it is interactive. What I mean by that is, it creates a filter in the app. So, if I click a specific keyword in the phrases word cloud, I am filtering for only those posts that used that keyword. For example, in the below GIF I am in the Conversations section of the software. I see all of the phrases surrounding our department’s social media accounts and blogs in the last month. That is, every post that mentioned 1 of our social accounts, our hashtag or our blog (Note: This is what I’ve selected for this analysis focus). I then click on the #shepcomm hashtag which filters for only those posts that contain that hashtag. So, I can see the other phrases that are in posts containing #shepcomm. You’ll see that the blog source gets filtered out because the 1 blog post does not contain the hashtag. Next, I click Twitter. Thus, only posts containing the hashtag and Twitter are being shown. Lastly, I click on the neutral (gray) sentiment and we filter down to the 1 Twitter post that has neutral sentiment containing the #shepcomm hashtag. While not shown in the below GIF, in order to see what the 1 post was, I could click on the “posts” tab in the right-hand side of my screen to see the original Twitter post. For the sake of keeping this post length manageable, I will stop there. Suffice it to say, I am just touching the tip of the iceberg on how you can use this software. I will go into 5 key ways that we use the software in my class below which will further demonstrate its utility. And, you will get instructions on how to use the software for those 4 ways in the lab guide I provide my students which I will link to below. Before doing that, a few notes: The reality is, there is a lot more than can be done with Social Engagement by linking it to other software within the Dynamics CRM. For example, as I understand it, it can be linked with other software for social media customer relations management. But I have not gone down that path yet. One limitation of the software is that you have to program in what you want it to track ahead of time. Then, it begins tracking. For example, it isn’t like a Twitter search where you can go in and look into past 2,500 posts on a topic after the fact. If I know I’m going to want to track a hashtag or social media account, I have to program it and then I’ll get the data going forward from the time I programmed it. A second limitation is that it is not real time meaning that while you are looking at the software you don’t see the data changing if new Tweets are coming in. As noted previously, students in my social media class are divided into teams and each team is in charge of running a social media platform for our department’s social media. 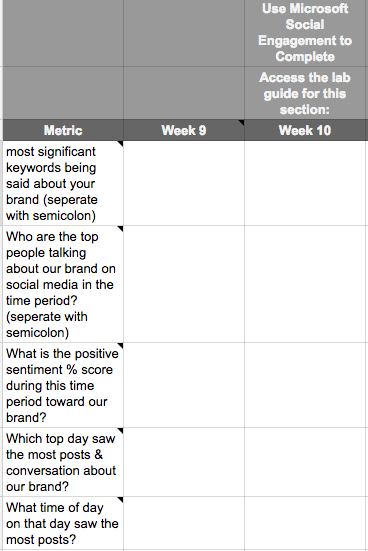 As I mentioned above and went over in depth in the prior post in this series, the students use a spreadsheet to track metrics for the social media content they create and post. Here is a copy of that spreadsheet as it was distributed in my Fall 2016 class. 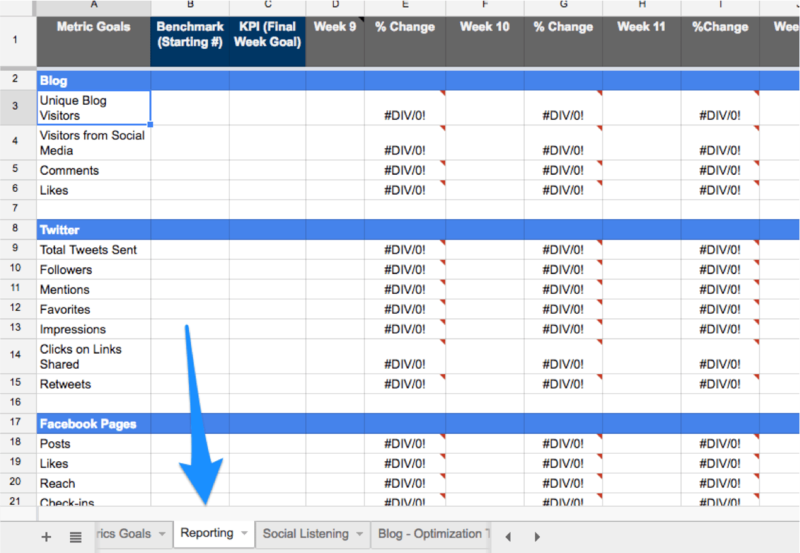 Social Engagement is used to work on the “social listening” tab of that spreadsheet. In short, the other tabs in the spreadsheet are about tracking our own performance. The social listening tab is about, well, social listening – seeing what is being said about our brand. The spreadsheet asks the students to answer 5 questions each week. You can see them below. A hint is provided to students on where to look to find this answer by mousing over each question. To help students learn how to answer each of these questions, I developed a lab guide (about lab guides). The lab guide teaches students how to use the software. You will find that reading through it can teach you a bit more on how the software works and how it can be used to answer the above 5 questions. In summary, these posts have provided an overview of how I taught social media metrics and listening my fall 2016 social media class. In my research class this spring we will be diving deeper into Microsoft Social Engagement and a few other tools for learning about social data. I am always looking to improve. I’m also looking to find new, cost-effective software solutions to expand social media measurement learning opportunities. If you have any suggestions, leads, or want to chat or collaborate, please Tweet me. In my Writing Across Platforms class, students write a news release for the social web. We have used PitchEngine to help students learn the web features that can bolster a news release. 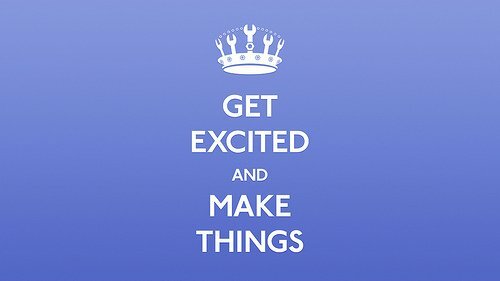 So let’s talk about PitchEngine, why it is awesome, and why I love it for this assignment. PitchEngine is a service for creating, hosting, and getting the word out about your organization’s news. It is an effective, visually appealing, and easy to use storytelling tool for reaching media – traditional and new – as well as brand fans. I say storytelling because, while a news release is one way PitchEngine can be used, it certainly isn’t the only way. Think of it as a platform for sharing your brand’s story. In other words, news releases aren’t simply pushed out like the old days – but they are hosted on branded space. This was an innovation that PitchEngine helped introduce. PitchEngine helped bring about the social media news release and so it is fitting that students learn the social media release using their service. PitchEngine CEO/Founder Jason Kintzler has been a leading voice for technology and change in the PR industry. PitchEngine includes custom layouts, multimedia utilities, and analytics features. Brands have their own page where all of their pitches are aggregated, such as the A&M Entertainment brand page. Media can follow these pages to get updates when a new pitch is posted. You can see a host of creative PitchEngine pitches on Pinterest. How have I used it in this assignment? When I give out the assignment, I discuss several important features about web writing – whether it be a news release format or a blog post. We talk about SEO, inbound links, and the role of search and sharing in helping people find your content. As part of that, we spend a good amount of time searching keywords on Google Keyword Estimator and Google Trends – things I’ve written before about here, and here. And we talk a little about readability and writing for the web – something I come back to later in the semester with more detail. After students write their initial news release draft with an emphasis on web writing, students put their pitches into PitchEngine. This is a great experience for getting to get a sense of how writing functions in the web world. Here are two of the several elements of web pitches I emphasize. PitchEngine emphasizes the visual element of the pitch. A look over their website shows that they take style seriously. This is no accident. They have easy-to-use, one-click templates for pitch layout. Here’s a great pitch from Keen that harnessing photos to show off their cool new shoes. In corresponding with Kintzler, he emphasized the value of shooting and composing great photos and visuals for pitch effectiveness. You can see the emphasis on visuals in a PitchEngine pitch, such as this. I try to impress this upon my students – requiring them to identify key visuals to bolster their pitches. After creating their pitches, they choose a template style that they find most appropriate to their pitch. Note: None of my student’s posts are public because that would mean they were… public, and since we write about real brands with mock situations that would cause a problem. So I won’t share them. But, take my word for it, they look great! As I note below, PitchEngine has changed over the last few years. They used to have a feature where you typed in ‘quick facts’ that readers can click and Tweet. That appears to have been replaced with a new, also awesome feature – Tweetables. Tweetables are parts of written text that make for good Tweets. That is, it is a section of a sentence that a reader can click on and Tweet. So, you want it to emphasize a key fact, stat, or point in your pitch that users would find interesting. It should align with your message strategies. I wrote about this concept a while back when I noticed Pew using this same feature to facilitate easy sharing of content from web articles to Twitter. I noticed that several students struggled with the Tweetable concept this semester. I think I didn’t explain it very well this semester, or show effective examples. Here’s an example of a Tweetable from a student release (company name redacted). Simply click the link, and Tweet! The folks at PitchEngine, including Jason, have been so generous and kind in all of my communications with them. They have generously allowed our students to use their tool for the 3 semesters over the past few years that I have taught this class. In that time period, PitchEngine has changed their features and pricing model. But they’ve always been happy to let our students used advanced, paid features – such as templates – for learning purposes; that includes now, that PitchEngine no longer offers free accounts. A big thanks to PitchEngine! I would love for PitchEngine to build a university program that can help students learn a bit more about the features, suggested strategies for maximizing pitch effectiveness on the platform, analytics, and ‘under the hood’ how it works, of PitchEngine. I think this would make for a great opportunity for more universities and for our students to get the very most out of the tool. As I’ve mentioned previously, here is my original social news release assignment (I’ve since modified it to reflect recent changes to PitchEngine). Dr. Gallicano and Dr. Sweetser have a great guideline for teaching the social media release (Note: PitchEngine is mentioned). I’ve adapted parts of their recommendations to improve my assignment. Has your class used PitchEngine? If so, how? What recommendations do you have for integrating it into assignments? Have you check out their, fairly new TinyPitch website? I need to find more time to explore this cool, new tool. Hope you are enjoying spring break! Happy St. Patrick’s Day! Several weeks ago I mentioned that a big change in my Comm 322 Social Media class this semester (syllabus), is that students will be working to create the social media for our department’s Twitter, Instagram, and a brand new blog. I want to share a little about the first assignment students do towards this project. My goal with this project is to provide students opportunities to apply what they are learning in class to planning and executing social media content plans for an organization. One of my main emphases is getting them intermediate experience planning and thinking strategically about social media content strategy. They get advanced experience with these things in the campaigns class. So social media class is a great stepping stone. So here’s what I did. I assigned a strategy plan assignment that students complete as the first step in the class. This gets them creating a plan for the type of content they want to produce, and how that content will align with our target audience, theme, and key messages, which I provide for them and emphasize repeatedly. The purpose is for them to learn to align their content plans with the overarching framework for our content – where we want to go. They then produce goals and objectives (or adapt from the goals & objectives a student created in a project he completed), create a channel purpose statement, and create a team workflow for how they plan to get their work done. I provide a series of roles for this, which you can see in the assignment below. To go along with their plan, they present to the class some sample content that aligns with their strategy plan and that they would like to see posted to our department social media. Other classmates complete an evaluation sheet of their peers, assessing in part whether the content is consistent with our class-wide goals, theme, audience, and messages. They also provide feedback on what content should be posted or not. And we only post the best content that aligns with our theme, messages, and hits our target audience. So, for example, does the content your team is proposing creating align with our key messages such as the one I’ve shared above? From there, I give students feedback on any adjustments to their plans or the type of content they want to create. And from there, they begin working on creating content that aligns with their plan – which they do 3 more times during the semester (creating the content, not redoing the plan). They present the content they created for a given time period class their content several weeks later. So far I am really enjoying this project. I truly believe students are getting to think through what they are learning and apply it. This way, they can see it put to practice, learn about the roadblocks and challenges, and get the benefit of the successes. Students have done a great job collaborating across teams to ensure consistency across different social channels, which is something else I emphasize in the class – the importance of consistent messaging and content experiences across multiple screens, which Brito talks about in Your Brand: The Next Media Company (one of our course books – thanks to Karen Freberg for recommending this text!). I’ll talk a little bit more about how the teams are organized, and share the content they’ve created in an upcoming post! Here is the assignment! Let me know if you have any questions, or thoughts on how i can modify or improve it! Over the past few years I’ve noticed an increase in how much students are thinking about how they present themselves online, their professional online identity. This is good news because according to a CareerBuilder survey, 37% of employers look up perspective employees on social media before hiring. (Personally, I was surprised by this – 37% to me seems a little low). Certainly what we say and do online impacts how others see us. If you teach social media, you likely follow many of your students on social media. Sometimes I cringe when I see the things some students Tweet. Every semester for the past few years I’ve taken time in class to talk about presenting oneself professionally online. This semester I decided to go about it a little differently. I decided to go a little more in depth. I am building a concentration of courses in our department that will emphasize strategic social media, and because the Principles of Public Relations class is the first class in the concentration, I decided I want to get students thinking about the professional uses of social media from the get go. Early on in this semester we talked about being professional online, the fact that many employers look up a potential employee on social media before making a hiring decision, and watched this video about the business of researching potential employees on social media (embedded below). I had them read Dr. Karen Russell’s great list titled “PR Students: What not to Tweet” over at teachingpr.org. I then had students fill out an in class activity about what being professional online means to them, and how they would want others to see their identity online (see it on Scribd). I photocopied the form and gave a copy back to them. I kept a copy. I told the students to start using Twitter, if they hadn’t already. (I decide to focus on Twitter, though I’ve come to find that many of our students don’t use or like Twitter. So maybe I should broaden my horizons in the future). I then gave them a little homework assignment (on Scribd). They were to print out tag clouds of their Tweets, their Tweetstats, and their profile and bring them to class the following class. The following class, I gave students a few minutes to look over the things they’d printed the night before (their stats, profile, etc.) and had them answer some questions (found on Scribd here) about the sort of things they post, and whether what they post reflects how they want to be perceived professionally. We revisited Dr. Russell’s list of what students should not Tweet. Students checked whether they were following Dr. Russell’s guidelines, revisited what they’d written several weeks back about what being professional on social media meant to them, and revisited their statement from the class before about how they want others to see them professionally in their career of choice. The purpose here was to see if the students identified differences between how they had seen themselves and how they discovered through the exercise how others may see them based on what they post online. Through this, we were able to make a connection to our discussion the class period before about the potential harm brought on by a lack of co-orientation between an organization (the org being the student in this case) and its publics. Students who weren’t afraid to share what they post on Twitter to the class had their tweets projected on the screen using VisibleTweets.com. After, we talked for a while about professional behavior online. Many students expressed that they were increasingly conscious of what they post online, particularly out of concern that a future employer might see what they post. When they were younger, some said, they didn’t think as much about what they’d posted. Many felt it was unfair that people were judged for things they’d posted long ago, pointing out that people change, grow, and mature. I continue to see some students who throw caution to the wind, using social media as a place to vent all those frustrations and share those things they wouldn’t normally say to someone. But overall, I’m impressed by how much students today are considering the implications of what they post on social media. A few short years ago, this was not my experience.